Freyer's Tawny Rockbrown, Бархатница бероя. The species is It is found from Western Turkey across Southern Transcaucasia and the Elburz mountains to Kopet-Dagh. Armenia is inhabited by subspecies P. b. rhena (Herrich-Schäffer, 1852), which occurs in several spots at the calcareous grasslands with stony slopes and gravel patches, located above 2200 m a.s.l. The upper limit of its distribution was noted as 3200 m a.s.l. at the Zangezur mountain ridge. The species' host plant is still not known, but presumably should be some Stipa sp. Butterflies are on wing from mid June till late July in one generation. The species is slightly uncommon or even rare within the typical habitat, and its population dynamics as somewhat stable (p>0.05), which could be justified by the fact that the livestock is rarely grazing at the stony slopes and screes. However, intensification of the livestock husbandry can potentially result in overgrazing at the slopes, and therefore in habitat degradation. The species is not included in the Global, European, and Armenian Red Lists, and also is not presented in CITES and Bern conventions. 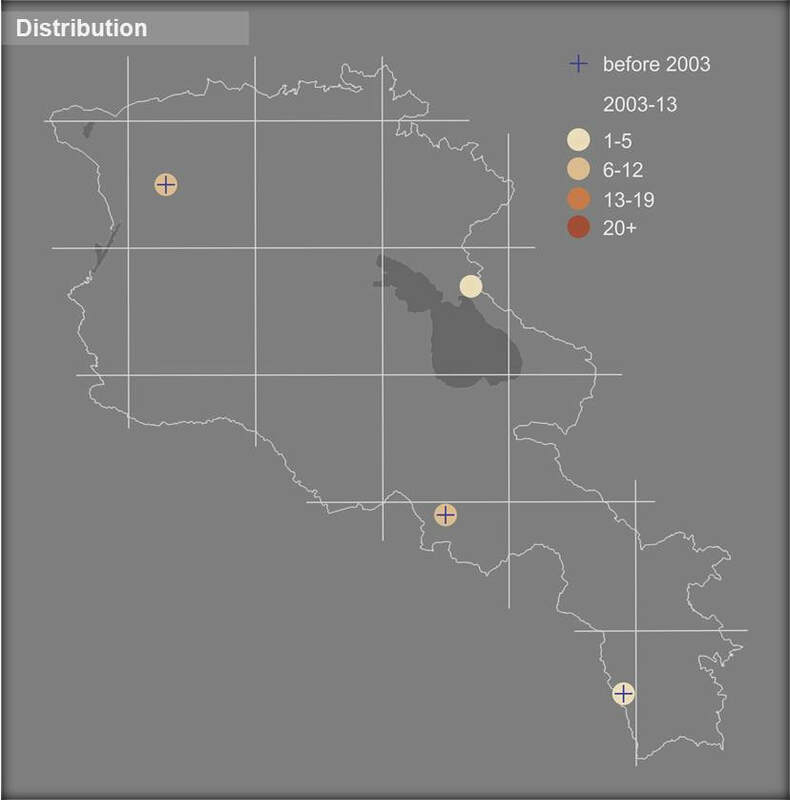 Its preliminary assessment for Armenia suggests conservation status of Near Threatened. The species' range is covered by Zangezur Biosphere Complex, Gnishik Protected Landscape, National Park Lake Sevan, and in addition by Emerald Sites Jajur. Also it is presented in Prime Butterfly Areas Lichk, Gnisheek, and Aratanish-Shorzha. Among conservation measures recommended for the species the following ones have to be mentioned: (1) inclusion of the species into next edition of Red Book of Animals of Armenia; (2) development of habitat friendly grazing schemes; (3) assessment and recognition of the Jajur site as Prime Butterfly Area.